Tire selection for the drivers. Top 3 pretty much the same. maybe should'v taken an extra hard since it showed potential in Aus, too late now but i wonder if there are regrets. Well the thing is, they choose this compounds way before race weekends, 14 weeks ago in fact, so probably mid to late December. So even if there's regrets, which I very much doubt, it's too late. 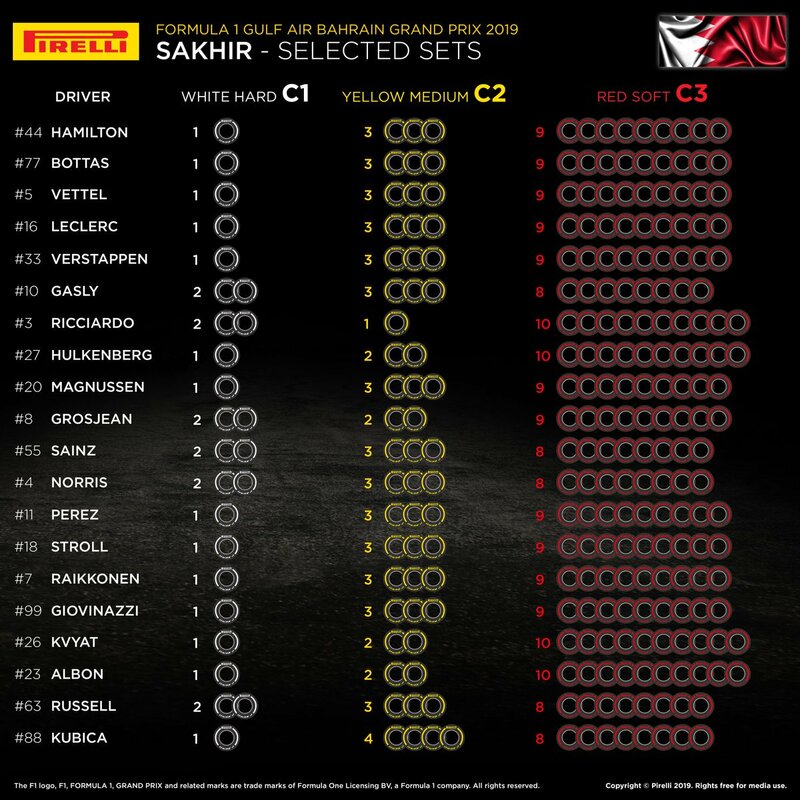 Somewhat challenging situation to have to choose tyres in December for a race in March when the first test was in February and nobody had a clear picture of how tyre wears will be. Every time the tyre choices are posted the same member questions it....track is very different to Aus the harder tyre is just picked because they have too, it won't be a race tyre for anyone trying to win the race. You said it all! That's F- Pirelli in charge. Sebastian Vettel has asserted that Ferrari will bounce back from its subdued start to the 2019 Formula 1 campaign, stressing its SF90 has untapped potential. Ferrari led the way through pre-season testing and was expected to contend for a third straight Australian Grand Prix victory, but was off the pace throughout the weekend. Vettel qualified seven-tenths behind Lewis Hamilton and was overhauled in race trim by the Honda-powered Red Bull of Max Verstappen, while Mercedes went on to register a 1-2 finish. Vettel led a 4-5 for Ferrari and the team conceded in the immediate aftermath of the race that it was at a loss to explain its performance deficit. “I think we have all the tools, all the ingredients that we need,” asserted Vettel. “We have a good car, we know it. This weekend we didn’t, overall we’re not competitive enough, but we will be back. “Last year we left winter testing with problems on the car. It wasn’t behaving the way we wanted it, the way it should. “This year was the opposite, the car was behaving the way we expected and it felt very good. “That’s why we came here last year and the balance wasn’t right, because we had to cover up. We had a very poor rear end last year and felt we had to trim the car towards understeer a lot. That didn’t feel great. “We managed for this weekend last year, and the race pace was fine, but we weren’t there in qualifying. We got lucky in the race, but I think by Bahrain we had fixed all our issues from winter testing last year in the first race, and that’s why I think we all of a sudden unlocked a lot more pace for last year. “This year, the problem that we have has nothing to do with what we have seen last year. “Still all the car and all the numbers and so on make sense also this weekend, but clearly we’re missing something. Team-mate Charles Leclerc also expressed confidence that Ferrari will be more competitive in the coming events. “In the end, I think as seen, it’s not like we arrived with a very different car to testing, it’s not like Mercedes is either has come with very different cars, so I think the car is there,” said Leclerc. “In the past, it has been seen quite a lot of times that [Melbourne] is quite a strange track and it’s not always very representative of the real performance of all the cars here in Australia. Heavy rain in Bahrain on Wednesday. And chance of little bit of rain on Friday, Saturday and Sunday. Rain in Bah rain! 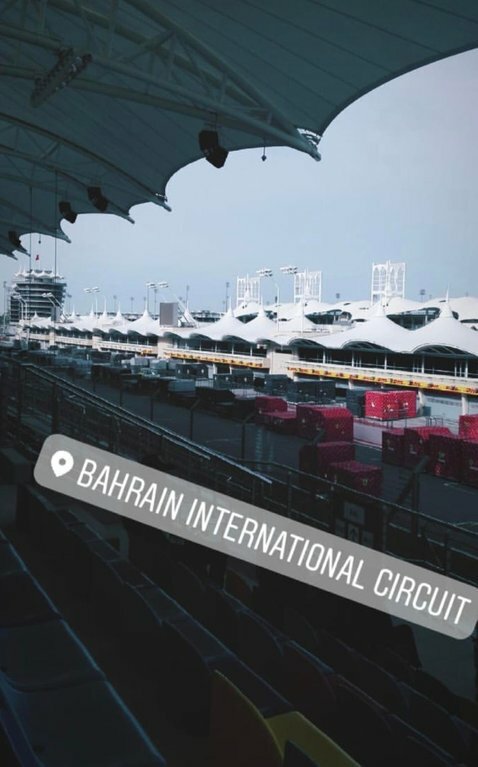 Well it rains on everyone, so good luck to our Ferrari guys. The tires will get us through! A list of "rainmasters" from 1950 to 2014. Think for once the "tech." and tires THEN compared to 2014.
Who was the best wet-weather driver? [AMuS] For Bahrain Alfa Romeo is expecting another leap forward. In Bahrain Alfa Romeo will bring the update which didn't bring the desired results during the 2nd week of testing. The update is corrected now and it should be introduced in Bahrain! Changing names does not win races. Give Seb a break! In Germany last year he forgot his umbrella ! did you guys read this?? conspiracy or TRUTH in this?? what do you guys think?? I believe Merc the team; Toto, and Lewis are so confident in what they have for 2019, that together they decided to let Bottas take that win. A happy; willing #2 driver is as important as anything else they might need for the WCC . Lol they said the samething last year in Australia after merc easily destroyed ferrari in quali. That merc accidently showed more power than they supposed to. Got no doubt merc have had the best car and engine.till now. Ferrari had no chance especially with development side of things. Fact they favour lewis over nico and bottas isnt even a secret. But i dont think they helped others out with plans and things lol. Toto definitely hides more pace and can easily crank it up whenever. They just want the racing to look closer then it is. But rain in Bahrain will be nice, will be a good battle between Max and Lewis then. Vettel's rain abilities are definitely very good, but I think he lacks the ability in the rain Max and Lewis have. I hope the Ferrari is not a dud in the rain it was last 2 years. Very nice article, speed read through it, but it is amazing to read. Hamilton quite high on the list. But I feel in the old days the differences between cars and wet and dry was far greater. But I feel in the old days the differences between cars and wet and dry & IDEAOLOGY was far greater. Bahrain, rear-limited track with long straights. China, front-limited track with long straights. It'd be interesting to see how the car performs at these two tracks.